What do you get when you send an American composer to Beijing 4 times in 3 years, with the task of trying to describe musically the impact of the economic boom times in China? You get The Economic Engine, by Neil Rolnick. Scored for a combination of traditional Chinese instruments, string quartet and digital processing, the piece is performed here by the New York based Music From China ensemble and the Todd Reynolds String Quartet. The spectacular Reynolds is joined by Kathleen Supove in Hammer & Hair, a wild 20-minute violin and piano sonata. Rolnick's Washington Heights neighbors, the trio MAYA, join him in Uptown Jump, to celebrate his grandson's move to the neighborhood. And just for perspective: a bonus track reissue of Rolnick's Real Time, a 25 year old outing for computer and orchestra. Whether written yesterday or 25 years ago, Rolnick's music sizzles with humor and wit, and with influences from down the block and around the world. As we cruise into 2009, talking about the end of genre divisions may be a yawn, but finding artists truly blending their influences with supreme confidence and tact can still be a challenge. Emerging from the pile wearing the stamp of successful integration is Neil Rolnick with his new release The Economic Engine. NEIL ROLNICK has been a prolific and inventive composer of electronic music for the last quarter-century, but lately he has been revisiting the joys of acoustic instruments. He has not abandoned technology entirely: in the title work, scored for Western string quartet and four Chinese string instruments, comparatively light electronic processing of the eight string lines adds a ninth strand, used sparingly. “The Economic Engine” (2008) is an idiosyncratic four-movement dialogue between antiquity and modernity, and its charm is in the blend, clash and interplay of Asian and Western timbres, gestures and textures. The Chinese instruments usually sing in their native accents (without using traditional themes) but stretch toward Western styles too, and at times the two sound worlds are juxtaposed: a keening erhu line is supported by a vibrato-rich violin. A different kind of dialogue animates “Hammer and Hair” (2007), a 20-minute fantasy for violin and piano. Here the tensions involve modernist timbral effects (though not electronic ones), an updated Classicism (a fugal section, for example) and a freewheeling jazz style that takes over the violin and piano lines at different times. The violinist Todd Reynolds and the pianist Kathleen Supové, comfortable in all these styles, move seamlessly through the colorful episodes. The brightly spirited “Uptown Jump” (2006), a study in rich, tactile textures and inventive variation, juxtaposes jazz moves with ragalike percussion patterns. Maya, a trio of flute, harp and percussion, plays it with grace and energy. For perspective Mr. Rolnick has resurrected a 1987 recording of “Real Time” (1983), an amusingly quaint work for synthesizer and chamber orchestra, originally released on a Composers Recordings LP. His writing is much more fluid and assured these days. Four new works on the CD by Neil Rolnick. All of them are very accessible and have a certain lightness over them. This is because Rolnick makes no secret of the fact that he finds inspiration in popular music. The titletrack ‘The Economic Engine’ attracts most of the attention. A work in four parts played by the Todd Reynolds String Quartet and the New York based ensemble Music From China. The String quartet is combined with traditional instruments. Eastern and western sensibilities accommodate with each other in a beautiful and respectful way. 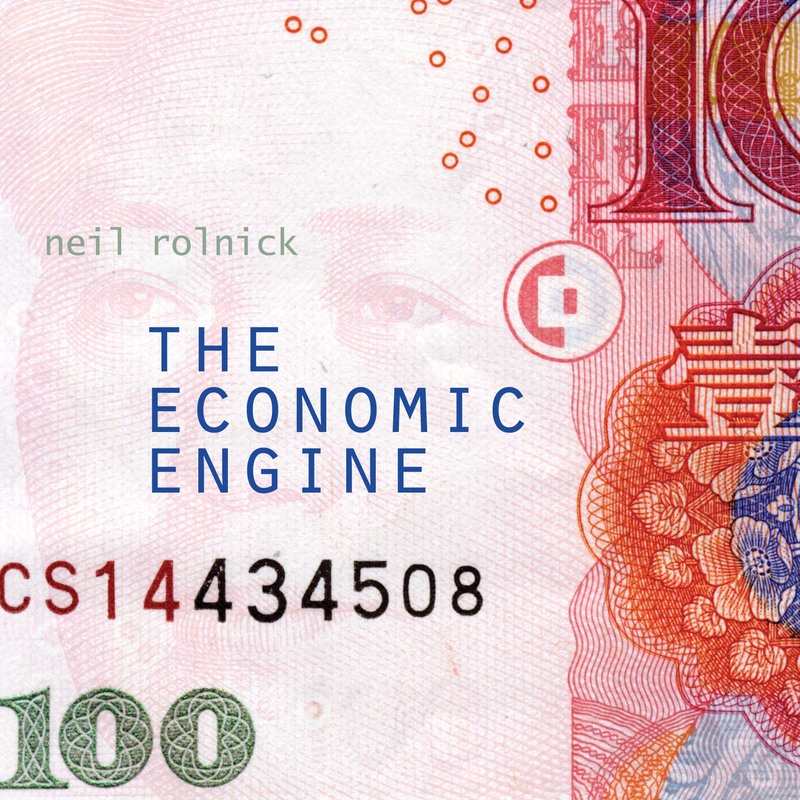 ['The Economic Engine'] is a fascinating journey through the sounds of a vibrant emerging economy, with its nods to the past courtesy of the erhu, guzheng and pipa, and its emulation of the West courtesy of the violins, viola and cello; the digital processing represents the high-tech gloss found in Chinese cities."